Swap of Disguise – The company Delfos Danza Contemporánea from Mexico has a guest performance for one evening at schrit_tmacher. In their award-winning piece “Cuando Los Disfraces Se Cuelgan (When The Disguises are Hung Up)“ they deal with the masks that all people are wearing. Each person is wearing a mask and each person is playing a role. A role that has been given to them or that is self-imposed. How and who are we when roles and masks drop? 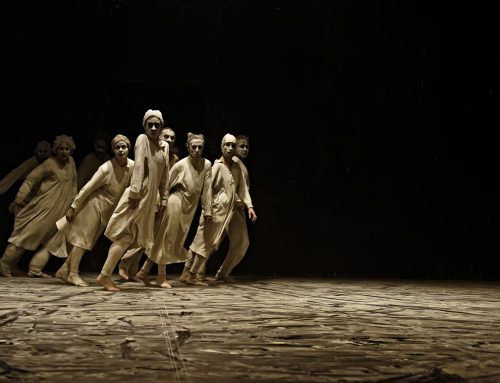 The six dancers of Delfos Danza Contemporánea do so. Claudia Vista, Johnny Millán, Daniel Marín, Roseli Arias, Karla Nuñez and Augustín Martinez want to be their own selves and are therefore questioning their personas, their presented masks and roles. The persona ensures a person’s social compatibility and tailors it appropriately to social structures and norms. Wearing this persona diminishes individuality but at the same time helps on the search for identity. A dilemma? It is all about the right fit. Only then a person is able to switch in between the number of moods, colors and tones and to question and define their identity. Delfos Danza Contemporánea wants to tell exactly this story. The Mexican choreographer and dancer Claudia Vista founded the company in 1992 together with her colleague Victor Manuel Ruiz. Ever since, they had great success in Latin America. “Cuando Los Disfraces Se Cuelgan (When The Disguises are Hung Up)” went on tour around the world. And although the piece is already a bit older (premiere in 2009) the audience of Heerlen, Netherlands, was enthusiastic about it. Maybe particularly because it is a piece from Latin America. A non-European dance evening that you do not find here. We are not used to what is happening there on stage. This might be due to the fact that Mexico is a vast country of various cultural and political influences and of over 60 recognized national languages. This variety is reflecting in the performing arts and puts our local viewing habits to a test. 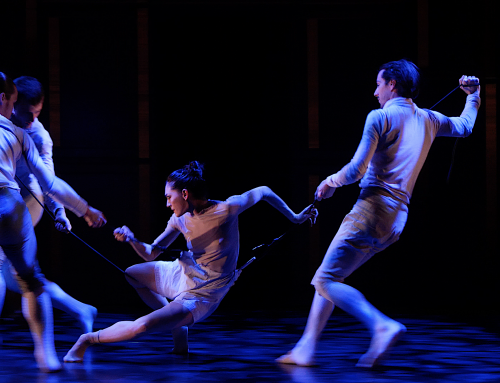 The European contemporary dance works, above all, with reduction, clear lines and clear decisions. With certain disguises and roles – if you like. 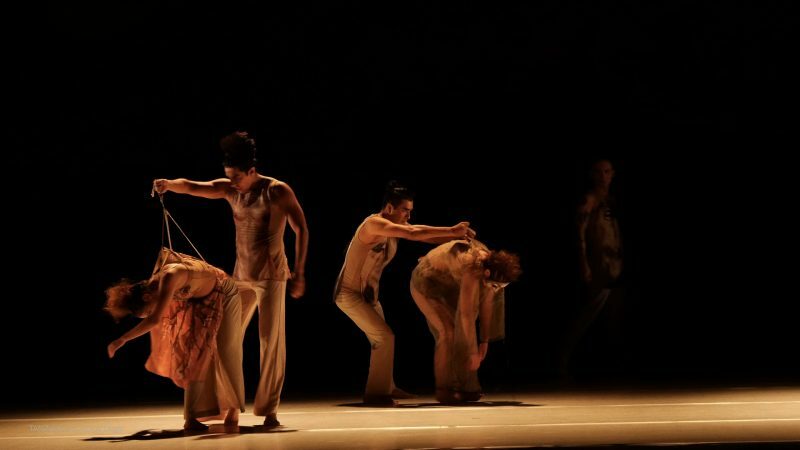 Here now an evening, an hour that Delfos Danza Contemporánea packed on stage – and that to its fullest. Sometimes the stage is shining in purple and right afterwards completely in green. 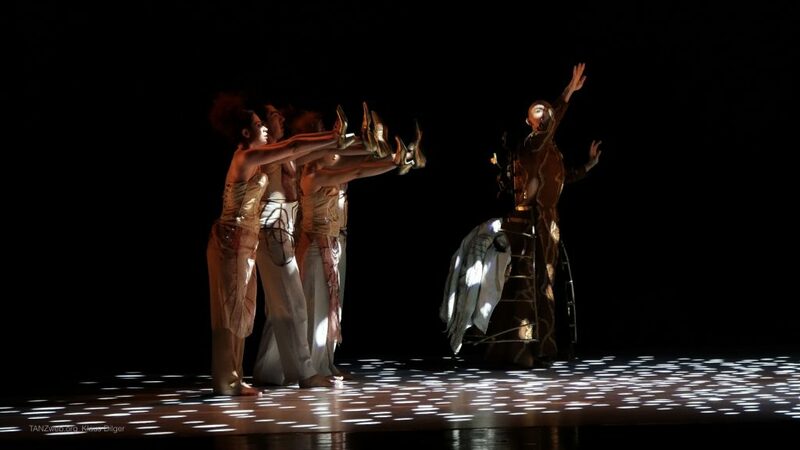 The costumes are discreetly opulent and the singular scenes are opening new dance worlds over and over where short stories are told about being with or without persona. In some episodes this is referred to more obviously than in others. In addition to that the company is taking masks, in form of costumes, on and not off – or do they? In the beginning we see the dancers still in flesh-colored underwear while they are soon to be dressed in flashy costumes. They are marionettes and their respective dance partners pull them up from the back or move them into certain positions. Or their jackets are sewn together at the back so they cannot escape the other and have to get accustomed to them. To their personas, their shadows, their other selves, society or simply life. They can rid themselves of the jackets as they can do it with social norms. This is being presented in dancing on highest level. There the very special dance partner of the piece is performing: the light. 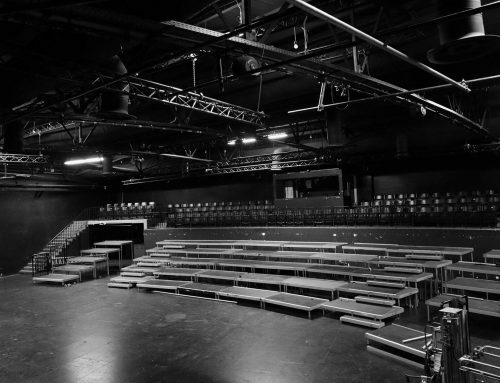 Designed by cofounder Victor Manuel Ruiz it is not only lighting the void in front of the dark stage background in embracing forms but also projects geometrical shapes onto the dance carpet. One of many symbols in “Cuando Los Disfraces Se Cuelgan (When The Disguises are Hung Up)“. Because light also stands for enlightenment and self-awareness. That what leads you to being yourself. Just as the aim: a life in freedom. Represented on stage through birdcages from which you want to be released. 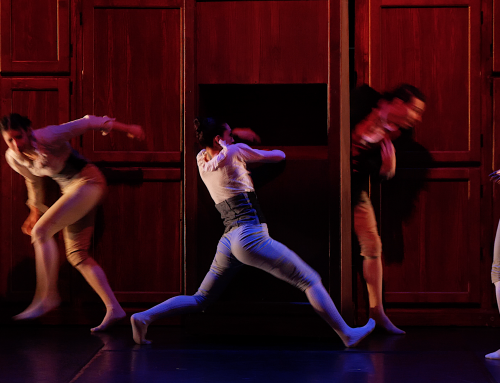 The dancers of Delfos Danza Contemporánea therefore take off their disguises metaphorically. It is all beautiful images and great movements that can be found representing the human wearing of masks in this particular piece. The music ranges until classical pieces from Bach and Vivaldi and the costumes by Eloise Kazan from flesh-colored underwear to baroque robes, detailed death masks and ambivalent jackets. 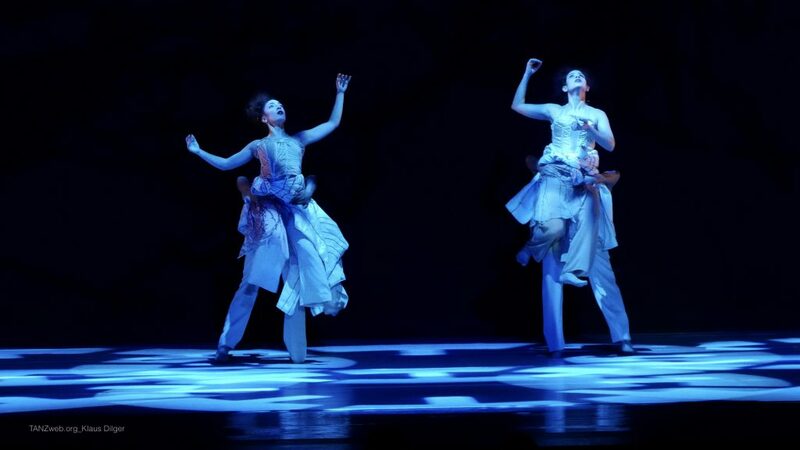 The choreography depicts likewise modern as classical ballet elements. Nevertheless, some gets lost in between of all that is happening on stage. In order to be able to grasp the entire depth and beauty of the choreography, the bodies, the costumes, the music, the symbols and the story, you want to stop them at times and reduce them in utmost European manner. Or you adapt to it. Taking off the European mask and putting the Mexican one on in return.